We’re working to improve water quality across a broad range of indicators and waterways in the Bay of Plenty. Setting regional targets that contribute to national swimmability targets set by Government for specified* rivers and lakes is just part of that work. Ministry for the Environment (MFE) has determined that 94.5 percent of the Bay of Plenty’s specified rivers and 85 percent of our specified lakes are currently swimmable. Swimmability gradings are based on modelled and recorded levels of E.coli bacteria in rivers, and toxic algae (cyanobacteria) in lakes. 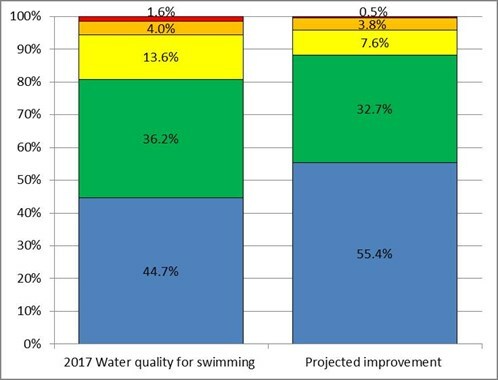 The MFE assessment shows that Bay of Plenty swimmability gradings are already better than the 2030 national target of 80 percent. We can do better than that, so have now set a regional target that will see 95.7 percent of Bay of Plenty rivers swimmable by 2030. MfE’s modelling work was not able to predict toxic algae improvements in lakes, so we have set the regional lakes target to maintain the current 85 percent lake swimmability rating. However we’ve been making substantial progress toward reducing E.coli and the nutrients that drive algae growth in Rotorua’s twelve lakes through our Rotorua Te Arawa Lakes Programme partnership. That progress is expected to continue as we keep delivering on nutrient reduction initiatives and lake action plans agreed with local communities. *Specified rivers are those classified as fourth order or above. Specified lakes are those with a perimeter of 1.5 kilometres or more. See map linked in ‘further information’ section below. We’ve got lots of work already planned and underway to keep improving water quality across a range of indicators (such as nitrogen, phosphorous, turbidity and oxygen levels, as well as bacteria and algae), in both nationally specified and locally important waterways. Achieving swimmability improvements in the waterways assessed for national targets is part of that work. The river target will be achieved through Council’s ongoing work to reduce bacteria and nutrient run off through the Tauranga Harbour, Ōhiwa Harbour, Kaituna, Eastern and Rotorua Lakes Catchments Programmes as well as through planned wastewater upgrades by Western Bay of Plenty District Council and wastewater and storm water upgrades by Rotorua Lakes Council. Modelling work by MfE has predicted that the river improvement targets can be achieved through those efforts, and that our work will also see the gradings for 16 percent of the region’s already swimmable rivers move from ‘good’ to ‘excellent,’ or ‘fair’ to ‘good’ (see diagram below). Current and projected 2030 percentage of specified Bay of Plenty rivers in each swimming category. Categories suitable for swimming are shown as blue (excellent), green (good) or yellow (fair). Categories not suitable are shown as orange (intermittent), or red (poor). New research work to isolate the sources of bacterial contamination that frequently affects popular swim spots in the upper Wairoa River including McLaren Falls and the Waitetī Stream (near Ngongotahā) is starting this summer. And Regional Council staff are continuing to work with landowners to identify and mitigate E.coli sources at hot spots such as Kaiate Falls, Uretara Stream and Waiotahe. We’ll keep exploring a range of innovative new solutions to bring Lakes Ōkaro and Rotoehu up to swimmable standards too. Interventions in those lakes to date have included land use change, wetland creation, weed harvesting, alum dosing, aeration treatment, riparian fencing, planting, and run-off detainment systems. We're also working with iwi and local communities to set region wide and catchment specific limits in the regional plan to manage freshwater quality (including swimmability) and quantity. Map and list of MfE specified rivers and lakes for swimmability improvement targets.